Dental implants are permanent restorations that look, act, and feel like your natural teeth. At Dental Professionals of Fair Lawn, we can custom-make your dental implants to blend with your teeth in shape, size, and color. In many cases, our dentists are able to provide patients with a new smile in one day! If you have missing teeth, or if you have teeth that are beyond repair and require removal, dental implants can help you to regain your smile with results that look and feel natural. They consist of two parts: the implant, which acts as a tooth root, and the crown, or restoration, which will act as your new tooth. In order to be considered a candidate for dental implants, you must have adequate bone density in your jaw since the implant must be anchored to the jawbone. Once one of our dentists has determined your jawbone is strong enough, you will be able to move on to the next step of the dental implant process. However, if you are not an eligible candidate for the procedure, your dentist will recommend an alternative, such as anchored dentures or dental bridges. Dental implants can replace a single missing tooth beautifully, with the accompanying restoration specially crafted to comfortably fill the gap between your teeth. After the implant is inserted into the gumline, a dental crown is custom-made to match the shade of your teeth for a natural-looking restoration. Plus, a single-tooth implant typically requires less jawbone volume to achieve successful results than restoring multiple teeth. If you have more than one tooth in need of rehabilitation, dental implants can also be an excellent way to fill the expanse of multiple consecutive teeth. When many teeth in a row are missing or damaged, the result is usually a loss of biting function, as well as the shifting and misalignment of surrounding teeth. To avoid these oral health risks, dental implants can either be placed to individually replace each missing tooth, or a couple of implants can be utilized to anchor a dental bridge or partial denture. Our dentists will help you determine the best technique based on your needs and goals. For those who need to restore functionality of an entire dental arch, implant dentures can be a powerful upgrade from traditional dentures that allows your prosthesis to remain securely affixed to the jawbone. The procedure involves anchoring a custom-designed denture to the gumline using between four and eight dental implants inserted at very precise angles. In certain cases, our dentists can restore a complete row of missing teeth using only four implants with the cutting-edge All-on-4® technique. By providing a greater degree of security, implant-supported dentures can allow patients to enjoy a wider range of foods and feel more confident when eating or speaking. If your dentist determines that you are a good candidate for dental implants, the next step is implant placement. One of our dentists will place a strong titanium post beneath the gumline. The titanium implant will be anchored to your jawbone to secure placement. Over a period of months, the post will fuse with the jawbone, making it a permanent part of your mouth, and allowing it to act as a tooth root. During this time, a temporary crown can be placed atop the implant until the dental implant has successfully fused with the bone. After the dental implant has completed the fusion process, your dentist will have a custom-designed permanent dental crown made for you. This restoration will be color-matched to your surrounding teeth, and will be shaped to look and feel like a natural tooth. Once attached to the implant, this crown should act like a normal tooth. Best of all, because dental implants are designed to mimic a natural tooth and root, they do not require any special cleaning or care beyond your normal daily routine of brushing and flossing. Dental implants are intended to last as long as natural teeth and can provide decades of use as long as you maintain good oral hygiene habits. Similar to your natural enamel, bacteria buildup and decay can cause implants to prematurely deteriorate. The same can happen with excessive teeth grinding and clenching, which can damage or wear down your restoration. In general, daily brushing and flossing as well as routine oral examinations can help you prolong the lifespan of dental implants. 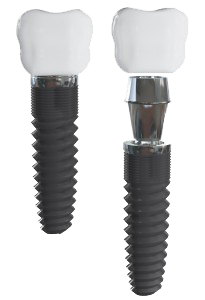 The cost of treatment with dental implants is determined on a patient-to-patient basis. While the price is calculated according to the details of your unique treatment plan, replacing a single tooth with an implant and restoration can generally cost between $3,000 to $4,500. To learn more about the different factors that can influence your dental implant expenses, please visit our page outlining the cost of dental implants in Fair Lawn. If you think dental implants might be right for you, please contact us today for more information or to schedule a consultation with one of our experienced dentists. We can help you to achieve the smile you’ve always wanted in just one day!